Steven (Chicagoland, United States) on 15 March 2017 in Cityscape & Urban and Portfolio. I just had to post this after getting pounded by a late winter storm for the last two days, burying us in 10" of fresh-fallen snow. Now the emerging daffodil and tulip foliage is buried. 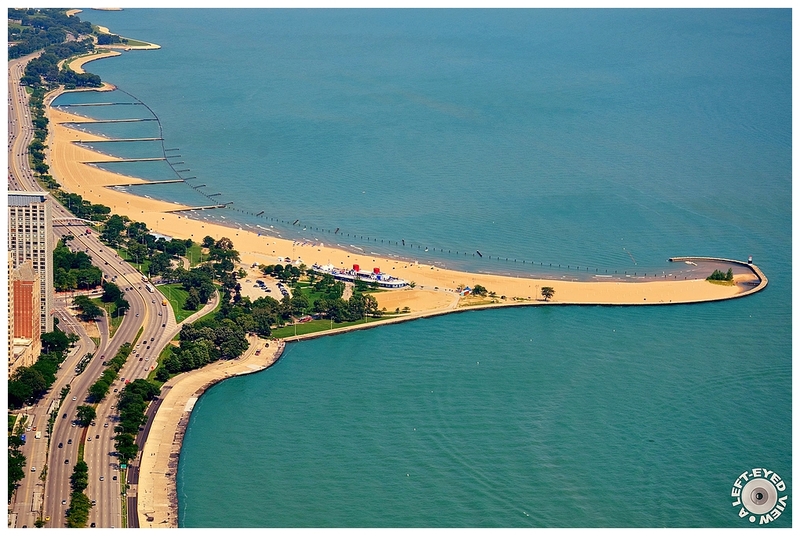 Located at 1600 N. Lake Shore Drive, North Avenue Beach is one of Chicago's most popular beaches. In the center of this photo is the beach house. This sleek, ocean liner-inspired building, decked out in a crisp blue and white, boasts one of the best views in the city. Permanently docked along the beach, the building contains 22,000 square feet. The beach house has upper decks and portholes for looking at the magnificent horizon or the multitudes of bikers, runners, walkers and rollerbladers streaming down the lakefront trail. This view is seen from the John Hancock Observatory. A great beach landscape and mielenkiintpoinen description opened the image content. Superb view you got from the observatory, love the final photo ! Quel découpage et contraste dans ce bleu quelle vue et couleur et ces formes sueprbe. Wonderful composition. Beautiful colors and details. It's simply wonderfull, amazing shot Steven congratulations ! Une très belle photo très bien cadrée ! A beautiful view ! I like the color of the sea also. Daffodils and tulips fight...they will come out !!! A fine beach picture to use when you are hit with falling snow. I like it very much. Nice viewpoint for this shot. étonnant qu'on a encore eu une tempête de neige.. This is a fabulous image. I love the lines. It looks like an abstract piece of art. I know what you mean about the snow. We didn't get much but it is so cold outside. I think that the tulips are done for this year. And they are worrying about the cherry blossoms downtown. How marvellous, and how different from the pictures of Chicago we see on TV these days (re snow and blizzard and ice ...). I wonder if this sand spit is natural or manmade?!? But apart from that, I think it's fabulous to have a beach IN a big city! An excellent landscape and the sea looks so calm ...! Yes, very different weather than now. It's quite a beautiful beach and the beach house looks fabulous. That beach house must be a great place to live. I love this shot. Excellent composition. What a superb vantage point and visual result! Great view and the beach is very beautiful. It's stunning to me such highways and the beach. Beautiful composition colors and lights !